Sister Bay was named For the Sister Islands that Flank its harbor. This pair of small uninhabited islands is a significant nesting site for gulls and terns. 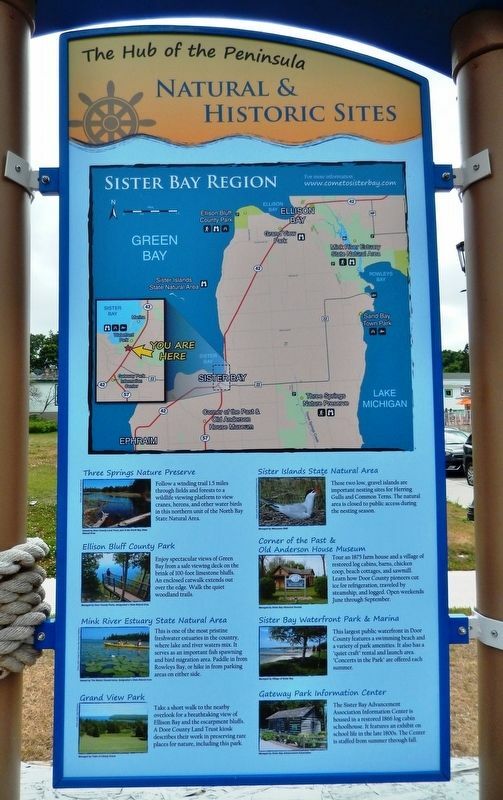 The Village of Sister Bay offers the largest public waterfront in Door County for viewing the islands, birds, and spectacular sunsets. The Sister Islands, located two miles northwest of Sister Bay's marina, are a historic nesting site for Herring Gulls and Common Terns. They are one of the most important gulleries in Green Bay. Birds will nest on the same island for up to 20 years. Sister Islands was designated a State Natural Area in 1966. Watch and listen for these familiar, pink-legged "seagulls" patrolling the shoreline for food. In the late 1880s, the population was nearly wiped out by hunters seeking eggs and feathers. Today, however, they are the most widespread gull in North America. They live an average of 30 years and eat almost anything. Door County into a string of islands. Today, Lake Michigan and Green Bay fill the same basin, but at a lower level. Cobblestone terraces of old shoreline still show the high watermark in Sister Bay. Natural & Historic Sites • Three Springs Nature Preserve - Follow a winding trail 1.5 miles through fields and forests to a wildlife viewing platform to view cranes, herons, and other water birds in this northern unit of the North Bay State Natural Area. • Mink River Estuary State Natural Area - This is one of the most pristine freshwater estuaries in the country, where lake and river waters mix. It serves as an important fish spawning and bird migration area. Paddle in from Rowleys Bay, or hike in from parking areas on either side. • Grand View Park - Take a short walk to the nearby overlook for a breathtaking view of Ellison Bay and the escarpment bluffs. A Door County Land Trust kiosk describes their work in preserving rare places for nature, including this park. nesting sites for Herring Gulls and Common Terns. The natural area is closed to public access during the nesting season. • Corner of the Past & Old Anderson House Museum - Tour an 1875 farm house and a village of restored log cabins, barns, chicken coop, beach cottages, and sawmill. Learn how Door County pioneers cut ice for refrigeration, traveled by steamship, and logged. Open weekends June through September. 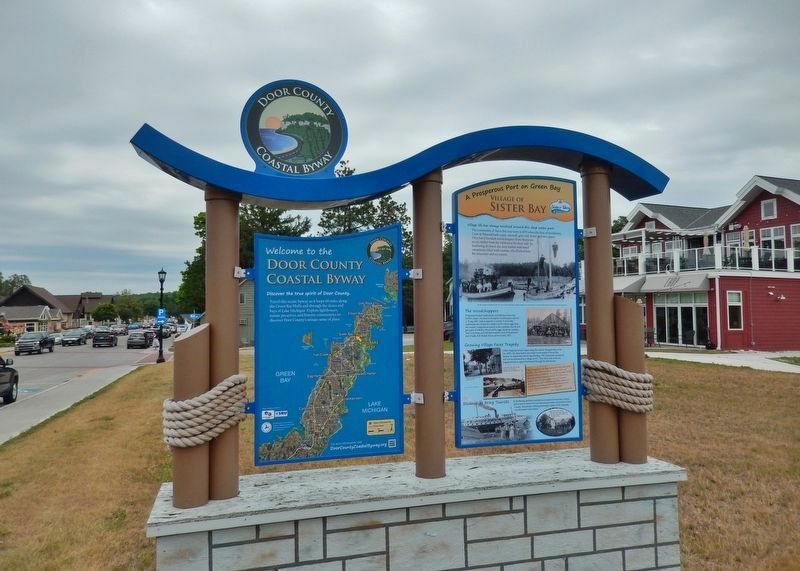 • Sister Bay Waterfront Park & Marina - This largest public waterfront in Door County features a swimming beach and a variety of park amenities. It also has a “quiet craft” rental and launch area. “Concerts in the Park” are offered each summer. • Gateway Park Information Center - The Sister Bay Advancement Association Information Center is housed in a restored 1866 log cabin schoolhouse. It features an exhibit on school life in the late 1800s. The Center is staffed from summer through fall. right when traveling north. Touch for map. Marker is located near the sidewalk, in a grassy lot on the east side of the highway. 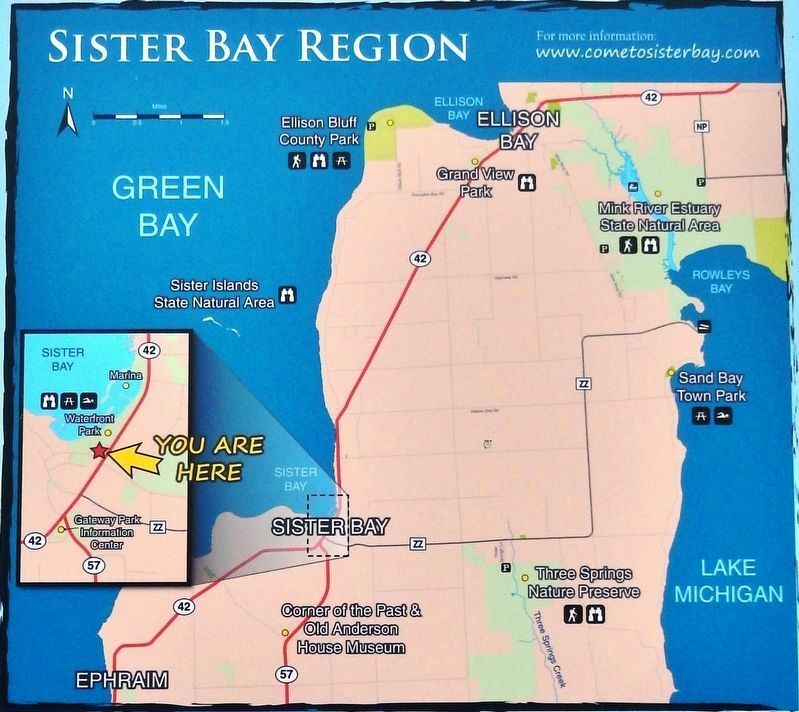 Marker is at or near this postal address: 2345 Mill Road, Sister Bay WI 54234, United States of America. Touch for directions. Other nearby markers. At least 8 other markers are within 5 miles of this marker, measured as the crow flies. Village of Sister Bay (here, next to this marker); Anderson Dock (approx. 3.1 miles away); First Permanent Colony in Door County (approx. 3.3 miles away); A Road Less Traveled (approx. 4.1 miles away); Life on the Ledge (approx. 4.1 miles away); A State Park System is Formed (approx. 4.3 miles away); Niagara Escarpment (approx. 4.3 miles away); Ellison Bay (approx. 4.3 miles away). More. 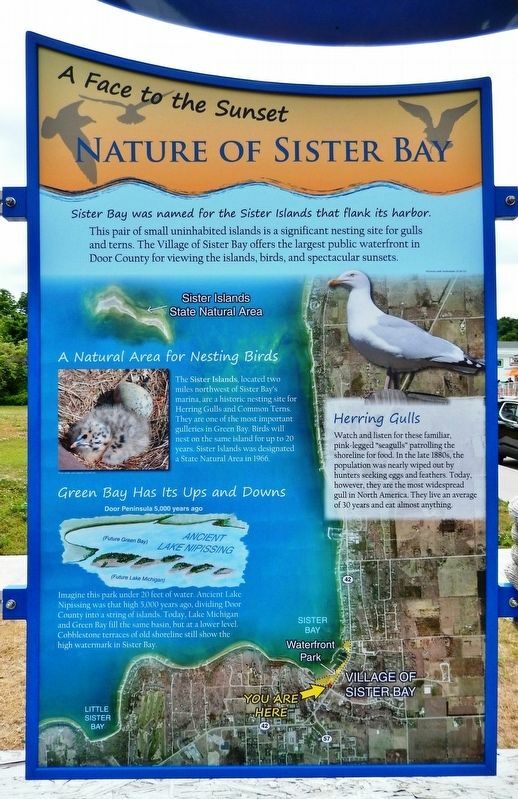 Search the internet for Nature of Sister Bay. Credits. This page was last revised on March 3, 2019. This page originally submitted on March 1, 2019, by Cosmos Mariner of Cape Canaveral, Florida. This page has been viewed 35 times since then. Photos: 1, 2, 3, 4. submitted on March 1, 2019, by Cosmos Mariner of Cape Canaveral, Florida. • Bill Pfingsten was the editor who published this page.